Stretch your goals, and your goals will stretch you. Set a narrow goal, and you'll reach the ceiling. Set a stretch goal, and you'll reach the stars. 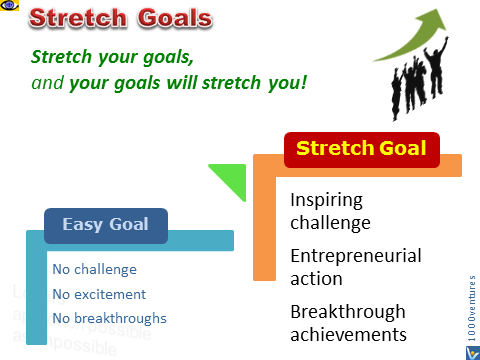 Stretch goal is an objective that cannot be achieved by incremental or small → improvements but requires extending oneself to the limit to be actualized. It is a challenge that is significantly beyond the → individual's or → organization's current performance level. "Let's be realists, let's dream the impossible." Stretch goals → energize and push you to → work smarter and harder at meeting more difficult targets and to achieve more than if you had set an easier goal. When you set a stretch goal for yourself you know that you may not meet it 100%, but by coming close you will likely achieve extraordinary results. Say, if you set the goal to "120," essentially asking an extra 20% of yourself, and achieve "115", you have managed to achieve 15% more than if you had set an easier goal. Stretch yourself. The higher you aim, the more you are likely to achieve. It is easier to make progress on ambitious dreams. Since no one else is crazy enough to do it, you have little competition. the word itself says 'I'm possible'!